Port Draughts: Entrance to Manly Harbour has a minimum 2.2 metres at low water. The maps below should not be used as an aid to navigation. The harbour map has been extracted from the Moreton Bay Guides published by Maritime Safety Queensland. To download PDF versions of the full guides, please visit MSQ.qld.gov.au. 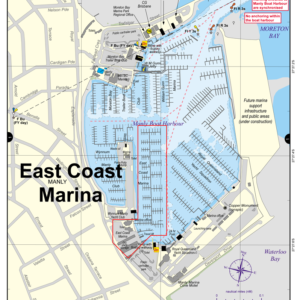 The delineation of East Coast Marina has been added to the original map and we have removed the reference to fuel at East Coast Marina as this service is no longer available. The berthing layout map is not to scale and should not be used for navigation. This shows the location of berths on the fingers and the queuing pontoons for dry storage clients. East Coast Marina is conveniently located within Manly Boat Harbour Brisbane and is just a short drive from Brisbane’s CBD. It offers direct access to the beautiful cruising waterways of Moreton Bay and it’s many islands. Just five minutes’ walk from East Coast Marina you’ll find the charming Brisbane seaside village of Manly, a popular weekend hub for both locals and visitors. Here you’ll find Manly Post Office, coffee shops, restaurants, The Manly Hotel, supermarket, and bus and train stations.